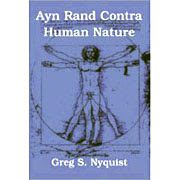 Ayn Rand Contra Human Nature: Are Values Hardwired? The latest findings suggest that a sense of fairness is deeply ingrained in human evolutionary history rather than the idea that it's a more cultural response, and thus, learned from other humans....Brosnan, along with lead author Megan van Wolkenten and Frans B. M. de Waal, both at Emory University in Georgia, trained 13 tufted capuchin monkeys (Cebus apella) at Emory's Yerkes National Primate Research Center to play a no-fair game. In the game, each of a pair of monkeys would hand a small granite rock to a human in exchange for a reward, either a cucumber slice or the more preferable grape.When both monkeys received cucumber rewards, all was fine in primate land. But when one monkey handed over the granite stone and landed a grape, while monkey number two got a cucumber, madness ensued. That makes sense. Humans have carried the trader principle to much higher more complex level, of course. I'm not sure that "many human do not accept the trader principle." Might it not be, that with our complex brains and all, that we many. many different ideas as to what constitutes a fair trade? Jay: "Another interesting take: since many humans do not accept the trader principle, is that surface-level evidence of free will." Not necessarily. There's a lot more going on than just the "trading" principle. There's also the "sharing" principle — a principle dominant in hunter-gatherer groups, which, in terms of evolutionary impact, is the dominant form of social organization since humans first evolved. The emotional attachment to socialism and other anti-capitalist ideologies may in part be motivated by a survival of those old "sharing" instincts — or in any case, a misapplication of them. The emotional attachment to socialism and other anti-capitalist ideologies may in part be motivated by a survival of those old "sharing" instincts — or in any case, a misapplication of them. This was Hayek's point in The Fatal Conceit*. Socialism takes a valid principle -- the importance of cooperation and altruism in family life -- and tries to make it the central organizing principle of society. *There is some question as to how much of this book is from Hayek.